The Billionty-Oneth Geek: Malcolm Gladwell's THE TIPPING POINT!!! Malcolm Gladwell's THE TIPPING POINT!!! 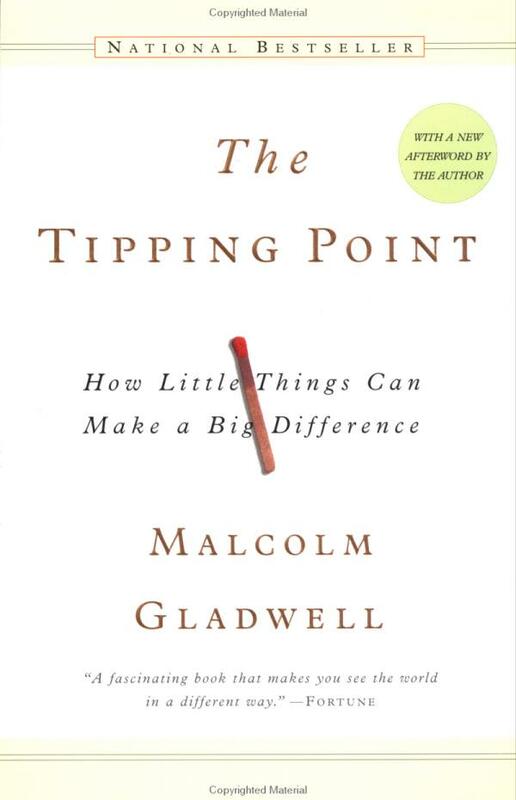 The Tipping Point is a bestselling book by acclaimed author Malcolm Gladwell. In addition to being an author, Gladwell is a journalist for The New Yorker having also written Blink, Outliers and What the Dog Saw: And Other Adventures (a compilation of some of his articles). 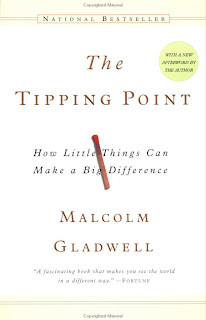 The ‘tipping point’, as Gladwell suggests in the title, refers to the point where a trend grows gradually until it hits a point where instead of gradual growth, it becomes an epidemic. He aims to prove that seemingly different epidemics occur for the same underlying reasons. He opens up the book describing two examples: the boom in sales of Hugh Puppy shoes in the late 90’s and the significant drop in crime in New York in the late 80’s/early 90s. Very different right? Yet he makes the claim that they are for the same reasons. He attributes the epidemics to three main concepts: the Law of the Few, the Stickiness Factor and the Power of Context. In describing the Law of the Few, the basis of the concept is on the 80/20 principle where 20% of the people do 80% of the work. In examining this principle, he comes across three types of key people that he sees responsible for change. They are dubbed as Connectors, Mavens and Salesmen. Connectors are people who are socially adept and are able to connect networks of people together. Mavens are described as information hubs. These are people who are up to date on the latest trends and the latest ‘it’ things. They are essentially a wealth of knowledge and have a pulse on everything going on. Lastly are the Salesmen, who are charismatic people of persuasion. These are the types of people you know who can persuade or negotiate. Gladwell proposes that if you want to start a movement, you don’t need to convince a lot of people; you just need to convince these three key people and get them together. The second, the Stickiness Factor deals with how certain pieces of information and the way in which it’s delivered are more retentive than others. In elaborating this idea, he explores the realm of children’s programming, specifically Sesame Street from its inception and evolution into a teaching medium for kids and also Blue’s Clues, and the different approach this show used in helping kids learn. Lastly is the Power of Context which talks about how our behaviour is affected and influenced by our surrounding environment. The book is an interesting read and if anything, Gladwell is able to insight thinking and conversation amongst his readers. Whether the results from his book are conclusive is up to the reader. In some ways, the book does inspire a sense of hope to the reader. The idea that you’re just one little cog in this giant wheel of life is refuted by Gladwell’s argument. The changes you want to make to the world are entirely possible. That said, there are things that you should raise your eyebrow at. Keep in mind that this is coming from a mathy-sciencey (eg. engineery) perspective. Although he throws different numbers and statistics, the approach though empirical, is not exactly scientific. All of the examples and cases he cites are after-the-fact. Though these facts may be true, they’re only true for these instances. A more scientific approach would be to take all these concepts and ideas that he has developed, and put them into practice to see if the desired results are generated. That way all the points he makes can be proven, and more solidifies his argument. The book presents a one sided look, but with a complementing side of proof and analysis, would build a stronger and perhaps conclusive case. It’s a fascinating read and hell, it’s a bestseller, there’s no reason to not have a peak within. You might not agree with what he has to say, but it does get you thinking, and I think that in itself is quite powerful. Til next time, later geeks!